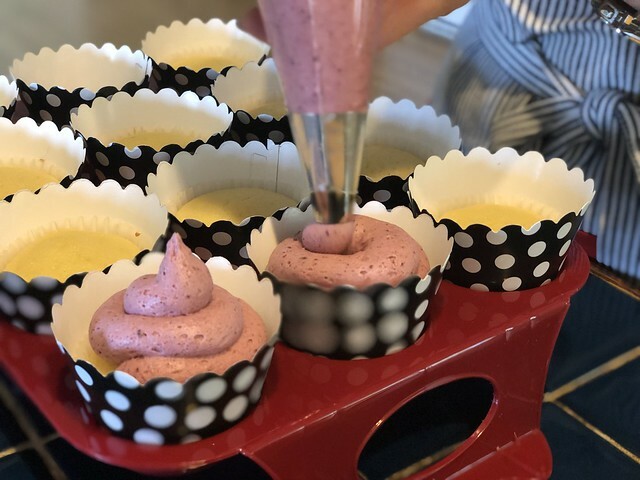 It's no secret that I love to make cupcakes and truly enjoy the chance to try my hand at new flavors and combinations. With Alex celebrating a "big" birthday this month, I knew I wanted to make a flavor I had never tried before. Every year I ask him to come up with a new flavor combo that will make his birthday just that much better, and each year I hope to be able to top the peanut butter and jelly cupcakes that have held the crown as reigning champion in Alex's "best birthday cake of all time" category. After a lot of flavor idea deliberation and back and forth between the two of us over the last several weeks, I had a lightbulb moment. One of the flavors of our wedding cake was lemon cake with a delicious raspberry filling and decadent vanilla buttercream. Alex loved this cake immensely (he even devoured the top layer after it had been frozen for a year), so I used this inspiration as a jumping off point but wanted to put a twist on it to incorporate blackberries, one of his favorite fruits. 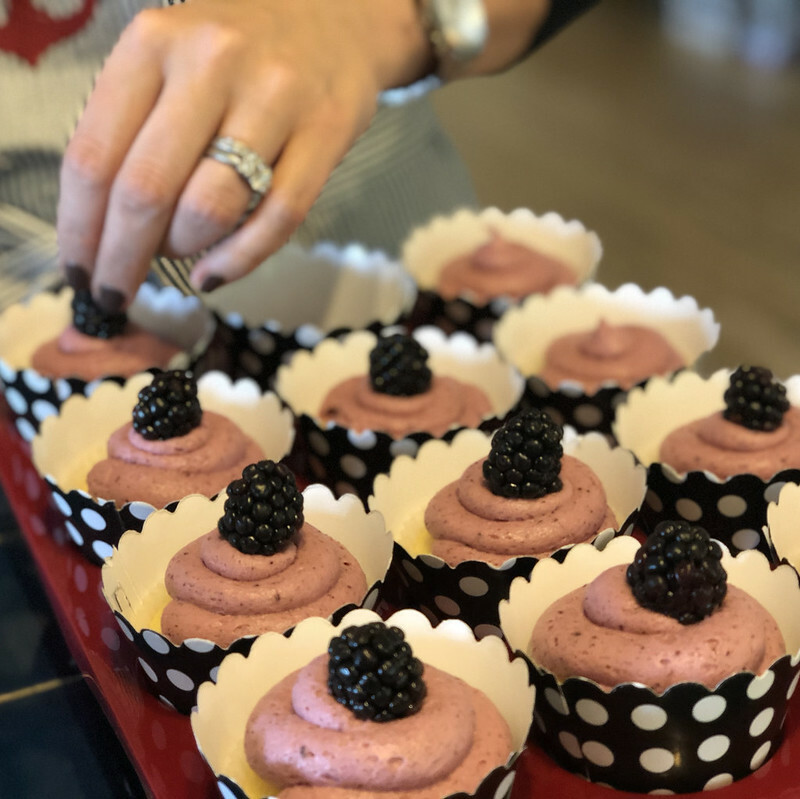 So I set out to whip up a delicious lemon cupcake with blackberry buttercream for Alex's birthday celebration. The thing I like about this recipe is that it has a manageable number of ingredients, isn't difficult to make, and the somewhat tart, dense cake is nicely complemented by the sweet buttercream frosting. In addition to trying a new recipe, I ordered cupcake wrappers for the first time. Because I was throwing Alex a big party to celebrate his special day, I thought the occasion called for a bit more pizazz. 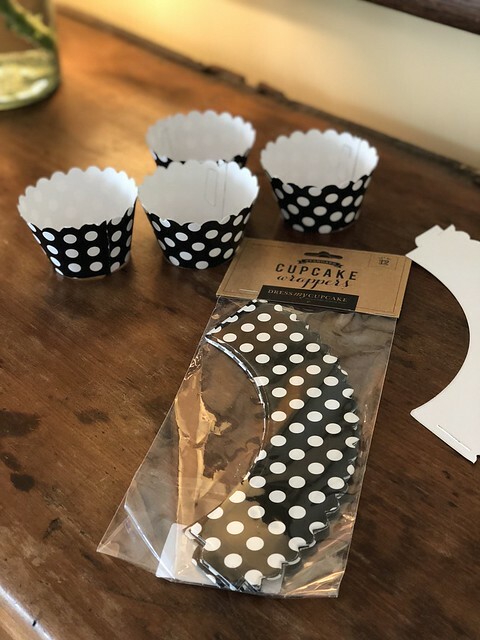 I found these cute polka dot patterned wrappers on Amazon that dressed up the look for the occasion for little effort and little money. To make cake batter, using a stand mixer (preferred) or handheld mixer, cream sugar and butter until well incorporated and fluffy. One at a time, beat in eggs followed by vanilla extract. Beat in flour and baking powder until thoroughly combined, followed by milk, lemon zest and lemon juice to make a smooth batter. 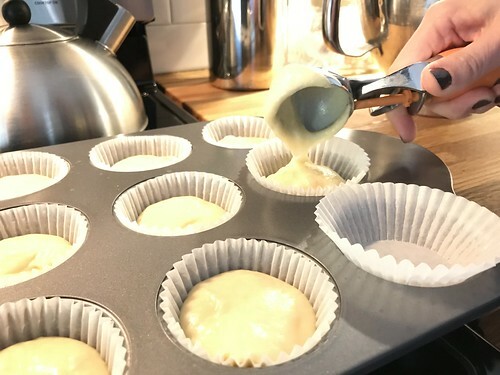 Using an ice cream scoop, equally divide batter among 24 muffin cups. Bake for approximately 20 minutes until cupcake edges are a golden brown and cake is cooked through. Cool completely before frosting. Begin making frosting by beating butter and vanilla extract until smooth. Mix in confectioners sugar, 1 cup at a time, to make a smooth and creamy frosting. Mix in blackberry jam until well incorporated and frosting is fluffy. 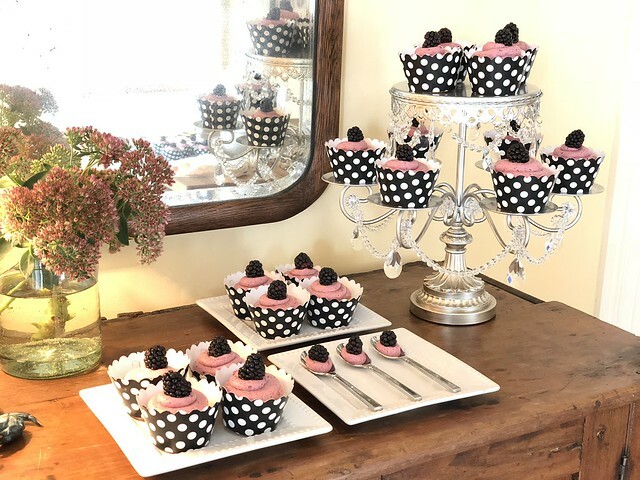 Top each cupcake with one fresh blackberry. 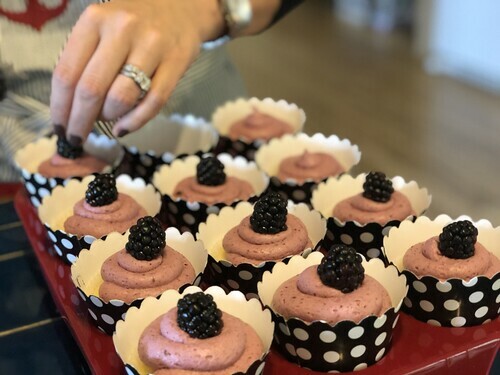 The cupcakes were both a beautiful and delicious addition to the party, and were given two thumbs up by all! And in case you're wondering about the "frosting spoons", we had a few guests attending the party that adhere to a gluten free diet. I didn't want them to miss out on what I think was the real star of the show, the blackberry buttercream, so I piped the leftover frosting onto a few spoons, topped by a blackberry. It was an easy and elegant way to ensure those that couldn't partake in the cake portion of the cupcake didn't go without without dessert. The only real challenge when it came to the cupcakes was the wind. A huge gust blew in right after I had lit the candles. 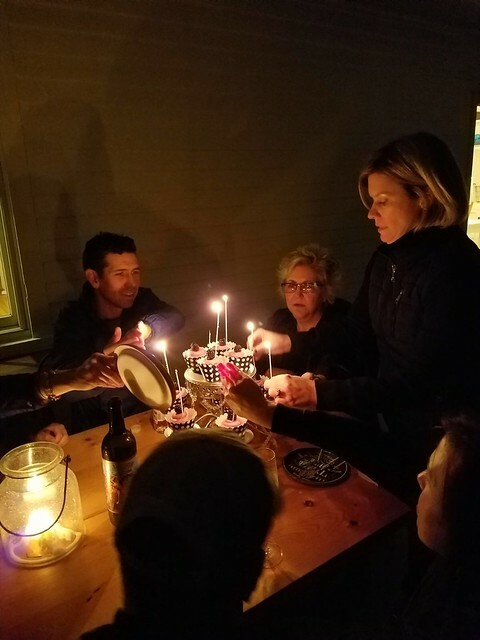 After a few laughs and several re-lighting attempts, the birthday boy was still able to blow out one lone lit candle to officially get his wish for the coming year. I would definitely make these cupcakes again, and in the future might try recreating our wedding cake. Hmmm. I'm thinking lemon cupcakes, raspberry filling, and vanilla buttercream might be my next endeavor. What's your favorite cake recipe? Do you have a favorite flavor cake and frosting to enjoy on your birthday or other special occasion? If so, I'd love to hear about it as I'm always looking for new and interesting recipes to try out. You met the challenge, and then some. But I'm really intrigued with the lemon/raspberry version; sounds perfect for spring. I LOVE your cupcake stand!! Is it actually a cupcake stand? Or did you just re-purpose a candelabra?